By Peter Anderson 10 Comments - The content of this website often contains affiliate links and I may be compensated if you buy through those links (at no cost to you!). Learn more about how we make money. Last edited June 23, 2016 . I get a lot of searches on this site from people looking for information about debt consolidation. Why do people want to consolidate their credit card debts, student loans, and medical debt all into one payment? Because oftentimes they think it is a magic wand of sorts – that it will cause all their debt problems to disappear. Unfortunately that's not the case, and in many instances people end up making their situations worse by signing up for a debt consolidation loan. The reason I haven't written about debt consolidation until now is because in most instances I'm not a big fan of doing debt consolidation. Many of the debt consolidation companies that you'll find out there really aren't going to do much for you that you already can't do on your own – and they'll charge you an arm and a leg to do it. Other debt consolidation companies are just plain scammers looking to take advantage of people when they're down. Still, there are situations when a debt consolidation loan can be the right thing to do. Just remember to be careful and consider some important things before jumping into a debt consolidation loan. When Should I Do A Debt Consolidation? First things first. What is debt consolidation? Debt consolidation is when you take several debts, and consolidate them into one loan in order to take advantage of lower interest rates, lower payments or the lure of having a simplified situation and one easy payment instead of several payments. Doing a debt consolidation loan should mean that you're moving into a better situation that is more manageable for you and your family. Unfortunately this often isn't the case. When doing a debt consolidation loan there are a few important things that you need to consider. If you don't examine these things it may mean that you'll make your situation worse – rather than better. Even with a debt consolidation, the problem still remains. Debt: When doing a debt consolidation loan people often feel like they've fixed their debt problem, when in fact all they've done is move the debt around, and possibly improved their interest rate a little bit. Don't be lulled into a sense of security by doing a debt consolidation. You haven't truly accomplished anything until you've erased the debts and become debt free. Consolidating both high and low interest loans could mean you'll pay more in interest: Too often people will make their debt situation worse by doing a debt consolidation loan because they'll lump all of their low interest debts (like student loans) in with their high interest debts (credit cards), just for the sake of having one easy payment. Too often this means that the consolidation loan has a higher interest rate than some of the debts they've lumped in – and they end up paying more interest because of it. Consolidating your debt may mean you'll be in debt longer: Often people consolidate their loans because they want to lower their total payment and make it more manageable. That sounds great, but the problem is that this means they'll often be in debt for a longer period of time – and for a larger sum of money. Sure the lower payments are nice – but they come at a steep price. Debt slavery! By consolidating your loans you haven't fixed the source of the problem – overspending/undersaving: By consolidating your debt you're really just treating a symptom of the illness, instead of treating the illness itself. What is the illness? Overspending and undersaving. According to figures that Dave Ramsey cited, a full 78% of people who consolidate their loans end up creating new debt to replace any gains they've made. Change your behavior instead, put yourself on a budget, do a debt snowball and you'll be in a much better situation. So as you can see there are a lot of reasons that doing a debt consolidation may not be in your best interest. Carefully consider these points before heading down this road – and make sure that you're actually addressing the underlying issues that have gotten you into the situation in the first place. Are there times when doing a debt consolidation is actually a good idea? Sure. You just need to make sure that you consider the points mentioned above, get yourself on a written game plan, and make sure that the debt consolidation loan is actually improving your situation instead of making it worse. That means you aren't lumping low and high interest loans together in a rate somewhere in the middle, you're not extending the debt out into the future, and you're not consolidating your debt without first getting yourself on a budget. When can a debt consolidation loan be a good thing? Take the situation of my good friend Matt over at DebtFreeAdventure.com. He recently did a debt consolidation loan through Lending Club. He took several higher interest debts, anywhere from 10.5% to 19.5% interest, and consolidated them all into a lower 9.32% loan. He didn't extend the length of the loan, and he has gotten his family on a written gameplan to get out of debt. They've made a commitment to making more money, getting gazelle intense, and getting out of debt as fast as he can. His consolidation has improved his situation, and in the end should be a good thing. Unfortunately not many people are as conscientious as Matt, and just get themselves into more trouble after getting their consolidation loan. There are a host of other options out there when it comes to getting rid of debt. Personally my preferred debt elimination method is the debt snowball through Dave Ramsey's total money makeover program. You can read about Ramsey's 7 Baby Steps to debt freedom on this site, as well as his Financial Peace University class that we took. If you don't care to read the whole series of posts, here's a quick look at how the debt snowball works. Pay off your smallest debt, get a psychological boost from knowing you’re one step closer to being debt free! While paying off debts many people will choose to take on part time jobs temporarily to create new income – so that they can get out of debt that much faster. When they are disciplined and create a written game plan most people are able to get rid of their debt within 12-24 months. You can too! 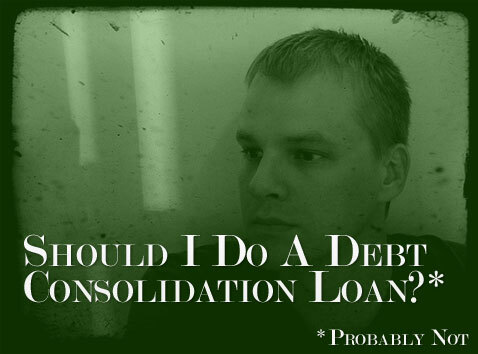 What do you think about debt consolidation? Is it something you would consider doing? If you have done a consolidation, did it improve your situation? Were you able to get rid of your obligations and become debt free? What steps have you taken to improve your spending and saving habits? Let us know your thoughts in the comments. I HATE debt consolidation loans, it just encourages mismanagement of money. I have fallen for this myself more than once I’m sad to say, it just masks the problem. Deliver pizzas, sell stuff, mow lawns, do something to increase your income temporarily and you’ll bust it out yourself. The way out of debt is not MORE DEBT! Well said Pete, great article. As Pete carefully lays out… debt consolidation is not usually a good choice, so be very mindful of the suggestions in this post. It worked for me because all of the variables added up to success. Just make sure you check all the variables in your unique situation. I consolidated my debt into a home equity loan a few years ago. As you point out, a big problem with consolidation is that many people then charge more and sink deeper into debt. Fortunately, shortly after my consolidation I started following Dave Ramsey and began paying off what I owed. It was both easier and harder paying off our debt given that it had been consolidated into that one home equity loan. It was harder because we never experienced any victories from paying off a smaller debt. However, it was easier because we only had one debt to concentrate on. We could focus intently without being distracted or confused. Ultimately, it took us about 20 months, but we paid off our loan to the tune of about $28k! It was an awesome day. If I had it to do over, I don’t think I would have consolidated, but it worked out and I’m debt-free to stay so it will never be an issue for me again. 1) It causes a false victory. People celebrate when they consolidate their loans. Some even have a party or go out for a nice dinner. This victory is not in fact a victory when you start spending again. 2) People can easily get distracted by hunting for great consolidation rates. When the focus shifts from getting out of debt to getting a better deal in debt your focus might be divided. Again, I am not saying there are not contexts where they are beneficial, but a person needs to seriously consider the possible impact. The problem with debt consolidation is that it has the potential to make the debt situation more tolerable. On the surface that sounds like a good idea, but the one thing you never want to do with debt is to make it somehow comforable, and that’s largely what consolidation loans do. Another problem is that it takes away one of the biggest debt reduction strategies you have, which is divide and conquer. You can’t payoff little debts, because they’re now sitting in a big lump in your consolidation loan. If you can payoff a small loan, the payment on it goes away. On consolidation loans, any payments you make will reduce the balance, but not the payment. Back when I didn’t know any better, I’d “take advantage” of low introductory rate APRs on credit card balance transfers. I’d then run up charges on the old card with the zero balance in addition to putting purchases on the new card. Many people make the same mistake. I find the biggest problem with debt consolidation is that shuffling debt around is dangerous to those who are undisciplined given that it provides them with access to more credit. First, there’s debt consolidation loans, which what you spent the majority of your article discussing. You pay off several debts with one new loan through some sort of lending institution. You list the dangers and potential benefits of doing it right. We are currently paying off our remaining unsecured debt using this route. We ensured we did it right by closing the lines of credit we paid off to eliminate the risk of racking up the debt again. Then, second, there’s debt consolidation the debt relief program – also called a debt management program. This is how we paid off $109,000 of credit card debt in 55 months. This is an option for people who’s finances have traveled down the road to crapsville far enough that most other ways of dealing with debt on your own no longer work. Unable to get a consolidation loan, and unable to make significant headway on the balances of the lines of credit due to the high interest rated. Debt relief companies will negotiate with your creditors a reduced interest rate and a monthly payment that will allow the debt to be repaid in 3-5 years. It’s said often (as you did in your post) that people can often do this themselves…..i keep hearing that, but it was not my experience. When I called my creditors in 2010, pleading my case, and asking for help they all but laughed in my face. My debt relief company lowered my interest rates, and got me monthly payments that allowed us to repay our $109,000 of debt in 55 months. We made one payment to them each month, and they dispersed the correct amounts to the various creditors. For this we paid $50 a month + a $50 setup fee. So all together we paid $2800 in fees to them…but over the course of that 55 months we saved about $40,000 in interest. 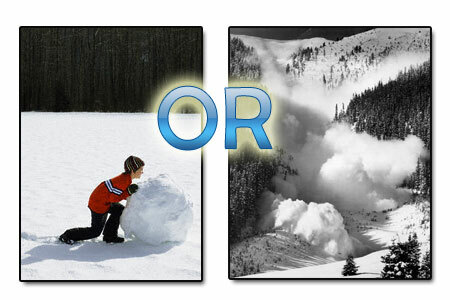 What Options Do You Have When It Comes To Your Debt? Like you say, debt management plans can work well for some people – as it did for you guys. Just make sure you get with a reputable company, I’ve heard a few horror stories of people getting in with companies that end up taking their money but never actually paying their debts off or worse. Do your research before you sign up! Well, it’s really up to the home buyers if they wanna consider that kind of concept just to avail convenience. Nevertheless, our licensed creditors will never encourage our clients with that since that is risky in the long run. Next Post: What Is The Average Retirement Savings By Age? Are You Falling Behind?